So what exactly is iGoogle? Simply put, it's your very own customized Google page. You can customize the plain Google search page into something that consolidates Google services you are already using, plus a wealth of other applications you can add, all for free. To get an iGoogle page, you need a Google account. If you are using a Google service that requires logging-in (such as Gmail or Analytics), then you already have a Google account. Still, it's very easy to get a Google Account if you don't have one yet, just head over to Google Accounts. 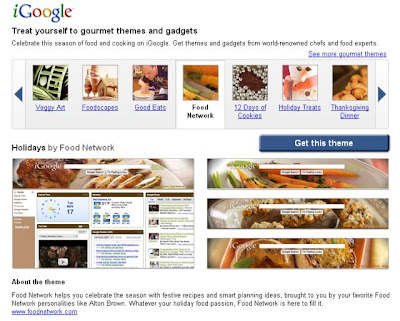 iGoogle has currently announced a wide range of culinary delights for your iGoogle page. 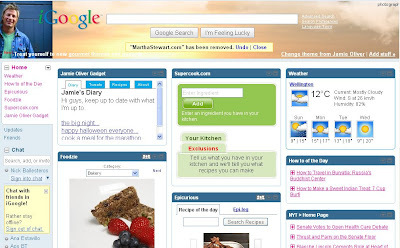 Choose from over 20 themes that personalizes your iGoogle background, and then spice it up a bit further by adding yummy gadgets. After choosing your theme, scroll down the page and select your foodie gadgets. 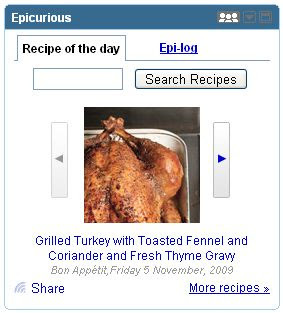 One gadget worth mentioning is supercook.com, which will tell you what recipes you can do based on what's available in your cupboard. A gadget looks something like the one at the left. This one's from Epicurious. At the top right, you see some icons. Hover your mouse on the title bar and a cross with arrows appear. This basically means you can drag this gadget to another location on the page if you so choose. The icon with people on it is a social networking thingamajig that I have not test yet. The icon with an arrow pointed downwards enables you to edit the settings of the gadget, or delete it. The rightmost icon maximizes the gadget to cover the entire page, revealing more information from the service provider (which, in this case, is Epicurious). You can easily switch back to the iGoogle page from there. For testing purposes, I used the Jamie Oliver theme (big fan!) My gripe about this is, I thought it will also automatically add a Jamie Oliver gadget (if there's one) but it didn't, so I had to do a quick search. So I assume the theme is really more on the background and colour. 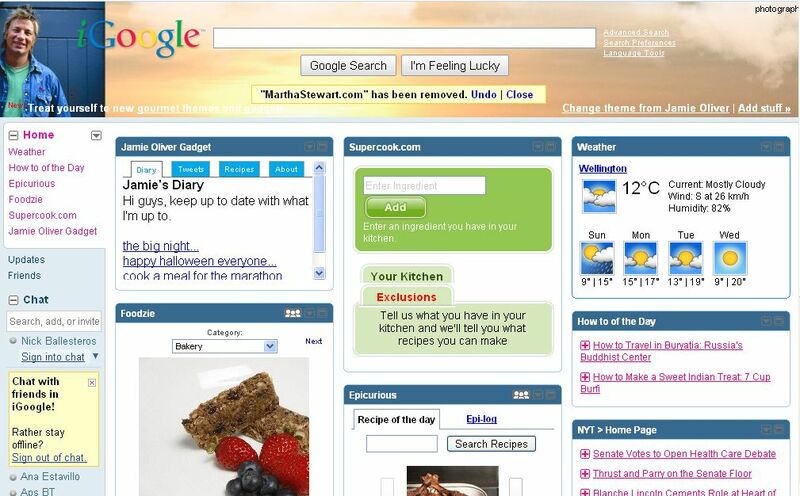 But other than that, the gadgets you can add to iGoogle is varied and wide. I added weather on my page, and might add some localized news as well. Try out the iGoogle Gourmet themes, a nice addition to your foodie inspiration.